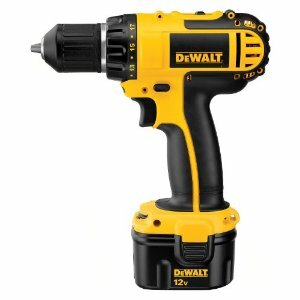 Here is a short description of how I opened a DeWalt cordless drill XR battery and replaced the cells inside. Why? I'm curious. I like to see how stuff goes together. I like fixing things in this disposable age. Read on for tales of electrical shorts, smoke, and cadmium. This information is provided only to show you how I did this. This is not intended to encourage any such behavior on your part. Something could go so seriously wrong that causes a tragic domino effect destroying your city, state, country, and civilization as we know it, reducing the planet to a desolate charred landscape with only the occasional one-winged smoldering cockroach plying the ruins. Not to mention - you will certainly void your warranty. Washing hands after touching NiCad's. Cadmium is nasty. Always treating the cells as if they were charged. Never allowing any wire, cell tabs, or metal to touch another. Cost breakdown: (10) $1.95 cells = $19. Cost of a new OEM battery: $45. See - it's not worth it. Don't try this. Play with your kids instead - maybe they won't turn out as career criminals after all. REMEMBER: the cells have charge in them right from the box. As they are connected together, the resulting voltage will increase, as will the shock and fire hazard if accidentally shorted! REMEMBER: something like this must be tested carefully, and SHOULD NOT BE LEFT UNATTENDED WHEN CHARGING FOR THE FIRST FEW TIMES!! I watched carefully as the pack was charged, placing the charger on a non combustible surface. No problems here. HOWEVER, I did have a short on the first test - I tested the pack at high load (causing high current discharge in the pack). A short caused smoke and melted plastic where the sharp edge of one of the solder tabs cut through insulation!! The short was easily fixed, but could have caused serious damage if it happened some time later. That said, my re-celled battery pack has lasted 5 years and counting! Please - if this information was in any way helpful to you, drop me a line and let me know - email me at . thanks!